commercial during the Academy Awards show! For over 109 years, Coldwell Banker has helped people find a home. ~to help dogs find a loving home. It’s no surprise that we believe every loving animal deserves a loving family…and a loving place to call home! “But, we’re not the only one!” As reported in the gmnews.com website today, the ‘Home’s Best Friend’ commercial was the brainchild of the marketing group, Siltman & Partners, the national agency for Coldwell Banker Real Estate LLC; and although the full ad is currently available on the Coldwell Banker website, most of the nation will see it for the first time during the unveiling on Sunday night during the Oscars! They anticipate over 40 million viewers will be tuned in, making this a tremendous opportunity to raise the awareness of this project. Coldwell Banker is legendary in helping people find homes; since 1906 they have been the premier provider of full-service residential real estate in the United States. 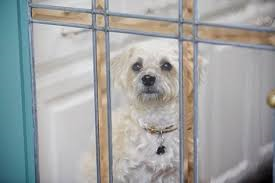 Abbie Moore, the executive director of Adopt-a-Pet says she’s, “amazed and inspired by the desire of Coldwell Banker to launch this amazing program.” ~and, Trust me when I tell you, it is one of the most heart warming TV advertisements I have ever seen! Even the behind the scenes footage on the Coldwell Banker YouTube channel is great fun to watch! The Harris Peppe Team has always been big supporters, both philanthropically as well as giving countless hours as volunteers at out local shelter here in Naples Florida. This new program has motivated us to continue helping adoptable dogs find homes in our community. If you have photos of a pet you’ve adopted, please send it to me at blogger@naplesrealestate.com so we can feature your ‘Best Friend” on our website! We have several 4-legged grand dogs, all from our local shelter! ~And, the last time my broker and I went to the Naples shelter to give a donation from the Coldwell Banker CARES Foundation, one of the fuzzy doggies caught her eye, and is now part of her loving home! As every dog lover knows, there’s not much that compares to the unconditional love you get from a pet. I am proud to be affiliated with a company that understands this and has done such a remarkable job capturing that love!